I’ve only recently become interested in the time of the Cousin’s War, and mainly because of Philippa Gregory’s latest novel series. So when I came across this book dealing with the women of the time, I knew I wanted to give it a read. 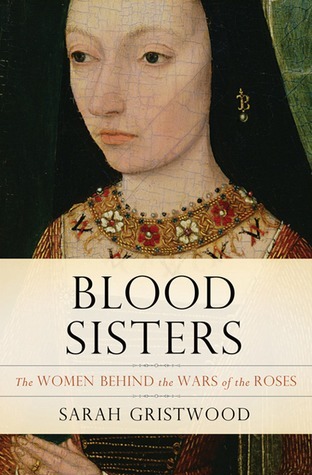 Not a lot can be known for certain about the women discussed in this book. The records are spotty and not always reliable to begin with, but women weren’t usually considered important enough to have much written about them. It truly is a shame, because it seems as though these women played a huge part in getting England through this crazy time. Each of the women has an interesting story, but some played a greater part than others. Margaret Beaufort worked nearly her entire life to get to her final position of mother of a king. Elizabeth Woodville came up from a low position to become queen. Her daughter saw how easily fortunes could change, but still made it through it all to become one half of the marriage that united a country divided. Sometimes, books such as this one can become a little boring and textbook-like. There were parts of the book I glazed over, mostly because the material being discussed wasn’t all too interesting, like how much money was spent on what things, but overall the book kept me interested enough that I really took my time to read this. I wanted to gain a bit of knowledge from this book that I wouldn’t have otherwise found. If you’re interested in the history of the Cousin’s War and want to learn more about it, this is definitely a good book to pick up. Thank you to Basic Books and NetGalley for an advanced copy of the book in exchange for an honest review. I have a huge, and at times odd, fascination with all things Titanic. It started when I first heard about it in the second grade and since then, I’ve read and watched as much as I can about the disaster. It’s hard to spring information on me that I don’t already know. However, this book was able to bring more depth to my knowledge and brought more people out in the story I hadn’t known much about. The set up of this book was simple to follow and allowed for a lot of information about each different aspect of the ship and its people. The first section focus on the building of the ship and the people connected with its construction. The second section looked at the passengers, broken down by class and crew. The last section was the most difficult for me to read because it dealt with the sinking and the aftermath, both for those on the ship and those that had lost someone. It was heartbreaking to read and brought tears to my eyes. This book was extremely well researched and detailed, but not to the point of reading more like an essay than a book. It brought an even more human element to the disaster. It’s one thing to know that so many people died, but this book brings to life those that sailed and passed away on that trip. It makes the tragedy even more real and important, even after 100 years. I know this book isn’t for everyone, but if you’re looking for a book about the people of the Titanic, this is a great book to pick up and read. After I finished reading this book, all I wanted to do was drive home and give my own dogs a huge treat and all the love I could. This was a heartwarming book that made me laugh and cry. As a person who loves her dogs more like little people than actual dogs, I simply loved reading about life through a dog’s eyes and his search to find his purpose. Why was he put on this earth and what can he learn each time his soul is brought back? I fell in love with the dog a little bit more through each of his lives, completely immersed in the story he was telling. This wasn’t like The Art of Racing in the Rain where the dog understands words and concepts completely. Instead, this dog knows simple words, but builds the view of the world through actions and his own feelings. He trusts his dog instincts and uses those to guide his life. He’s more like how I envision a dog thinking about everything going on around him. There were several times when I started to cry reading, so I suggest having a box of tissues near you as you read. It’s happy and sad tears, but it’s all worth it to read this stunning book. I wish I was able to write more about how this book made me feel, but I can’t think of any words that adequately describe the feelings. If you are a dog lover, you must read this book. It will make you love your dog even more than you thought possibly.